Graduated Harvard Law College (Cambridge, MA), 1897, received his Law Degree in 1899. Began his practice in 1900. President of Baseball Magazine, 1910 - 1945. Replaced Jacob Morse as President in late 1910. His photo/entry in Who's Who in Major League Baseball, edited by Harold (Speed) Johnson, 1933, pp. 503. Last edited by Bill Burgess; 03-27-2014, 12:09 PM. Lawyer associated with Baseball Magazine, from 1911. 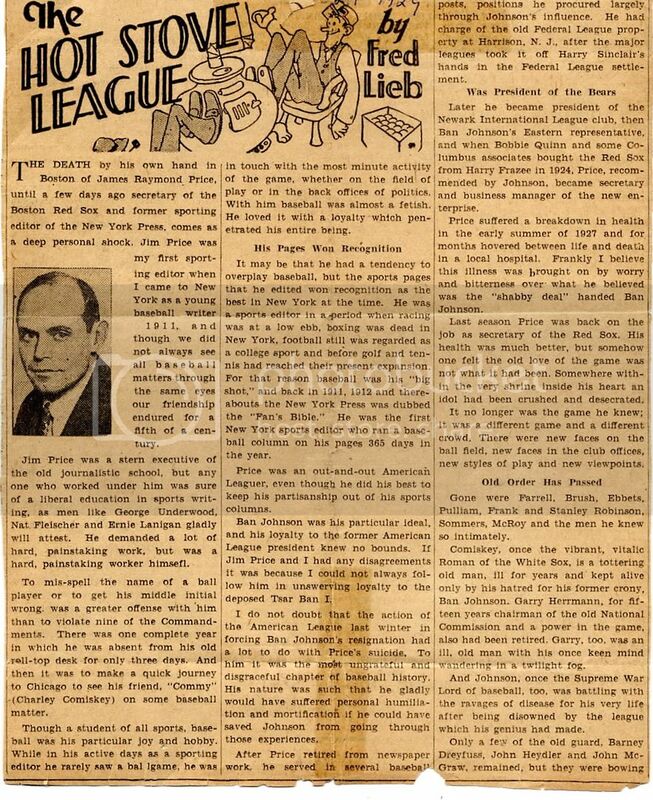 Was still associated with Baseball Magazine in April 11, 1942. Edward's Photo/Entry in Who's Who in Major League Baseball, edited by Harold (Speed) Johnson, 1933, pp. 503. Last edited by Bill Burgess; 03-27-2014, 08:22 AM. Arrived in US, 1860 at the age of 4. 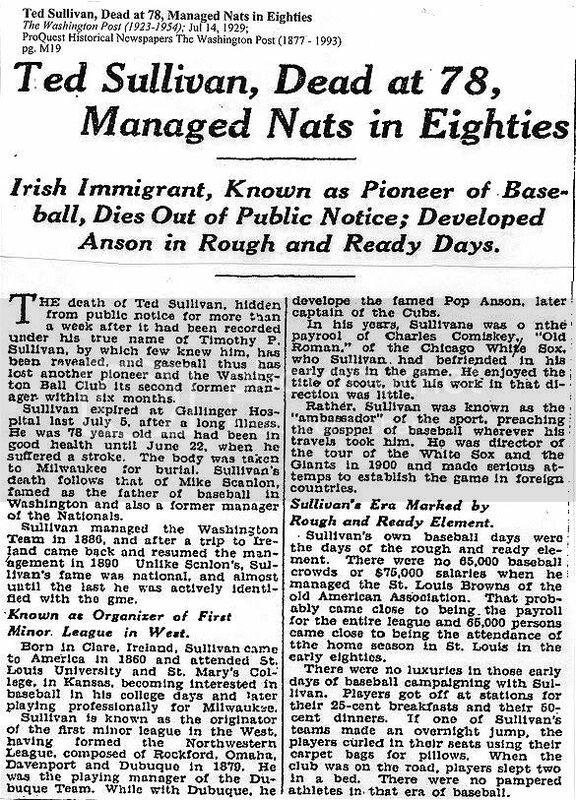 Timothy Paul "Ted" Sullivan (March 17, 1851 – July 5, 1929) was an Irish-American manager and player in Major League Baseball who was born in County Clare, Ireland. After attending Saint Louis University, he managed four teams during the 1880s, one of which was the 1884 St. Louis Maroons of the Union Association, who finished with an astonishing 94-19 record. He began the year with a 28-3 record, but moved on in midseason to manage another UA team, the Kansas City Cowboys; Fred Dunlap took over in St. Louis, compiling a 66-16 record as the Maroons won the UA pennant in the league's only year of existence. Kansas City was a dismal 3-17 when Sullivan took over managerial duties, going 13-46 the rest of way. During his time in Kansas City he also made his only three field appearances, playing two games in right field and one as a shortstop; he collected 3 hits in 9 at bats. He didn't manage again until the 1888 Washington Nationals, then 10-29, hired him to finish out the season. He led the team to a mark of 38-57, and ended his major league career with a record of 132-132. Sullivan later managed in the minors, including a stint with the Nashville Tigers of the Southern League in 1893. Sullivan is considered a pioneer of early baseball; he founded both the Northwest League and the Texas League, both minor leagues that still exist and thrive today. Credited with discovering Charles Comiskey, he is considered by some to be the first person to emphasize the importance of scouting. Comiskey joined the St. Louis Browns in 1882, and replaced Sullivan as the team's manager in mid-1883; it had been Sullivan's first managerial post, as he compiled a record of 53-26 to begin the year. Also, Sullivan was a great promoter of the game; he would tell stories of baseball's beginnings, and of its many star players. He authored books detailing these, including a barnstorming trip around the world in 1913-1914 by Comiskey's Chicago White Sox and the New York Giants. He also credited himself as the originator of the word "fan", as in baseball fan. Sullivan later became a team executive and owner. Sullivan died in Washington, D.C. at the age of 78, and is interred at Calvary Catholic Cemetery in Milwaukee, Wisconsin. Washington Post obituary, July 14, 1929, pp. M19. Last edited by Bill Burgess; 03-27-2014, 08:02 AM. Died: January 29, 1929, Boston, MA, age 66---d. suicide, cut his throat with a razor at Fenway Park, when no one was there, due to illness, note in pocket to wife. Was chronically ill.
Secretary of Boston Red Sox, January, 1924 - January 29, 1929, death. Father: William Thomas, born District of Columbia around 1824-37; Mother: Josephine B., born Maryland, January, 1839; First Wife: Marie W., born Maryland around 1867, married James around 1886; They were still together as of 1910; Second Wife: Anne Pauline, born New York around 1862; Sister: Alice, born Maryland around 1858; Brother: William, born Maryland around 1865; Sister: Edith, born Maryland around 1874; Son: James R. Jr., born Maryland around 1891; Daughter Addie M., born Maryland around 1889; Son: Frank; Son: Lester. Last edited by Bill Burgess; 03-27-2014, 07:44 AM. Will specialized in golf, tennis, college football, Olympics. 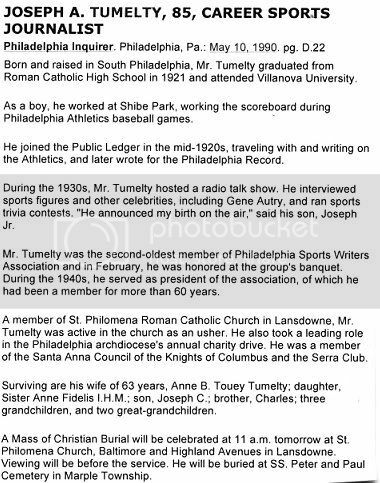 He covered most major events in boxing, baseball, football, horse racing. From 1977 to 1984, he wrote a daily nationally syndicated sports column, "Grimsley's Sports World". Contributed over 200 articles to magazines. Elected Sports Writer of the Year 4 times. Long-time sports reporter and columnist for the Associated Press, who reported from the world's biggest athletic events including 15 Olympics, 35 World Series and 25 Kentucky Derbies. New York Times' obituary, November 6, 2002, pp. C13.------------------------------------------enriching the gamblers and costing Liston everything. Clay, of course, was not in on the fix. Last edited by Bill Burgess; 03-27-2014, 07:39 AM. Died: June 19, 1947, Detroit, MI, age 74,---d. at home. New York Times' obituary, June 20, 1947, pp. 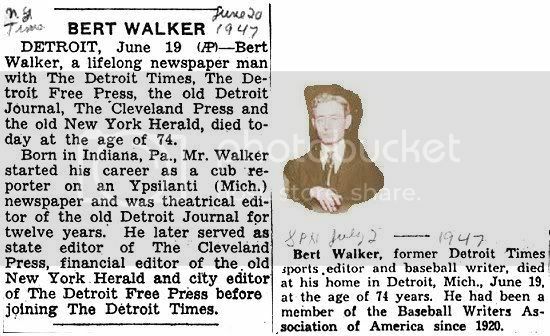 --------Sporting News' obituary, July 2, 1947, pp. 36. Last edited by Bill Burgess; 03-26-2014, 04:04 PM. Died: March 11, 1953, Douglaston (Queens), NY, age 71,---d. heart disease, at Parsons Hospital, Flushing, NY. Became official at Comiskey Park, home of the Chicago White Sox. Attended Tobin College, which his father, Rev. Thomas Tobin, had founded. Studied at Iowa University. Sporting News' obituary, March 18, 1953, pp. 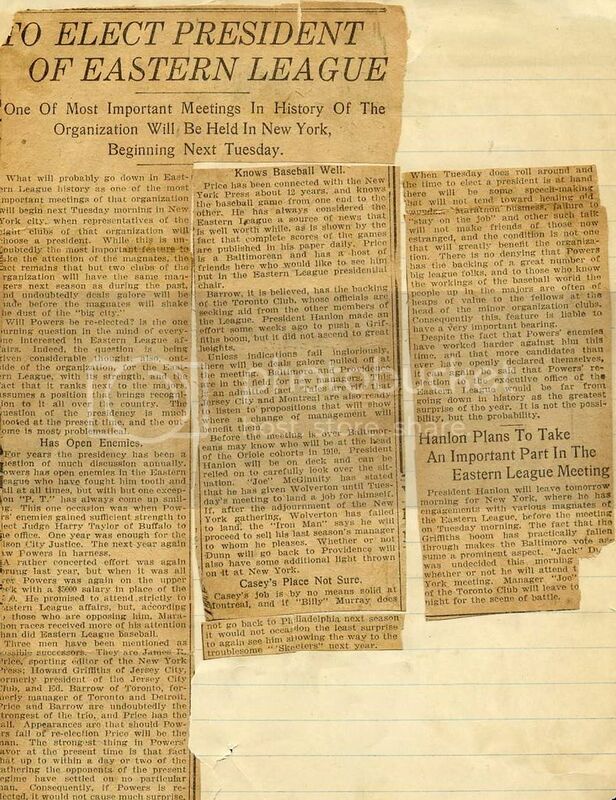 22.------New York Times' obituary, March 12, 1953, pp. 25. Last edited by Bill Burgess; 03-26-2014, 03:49 PM. 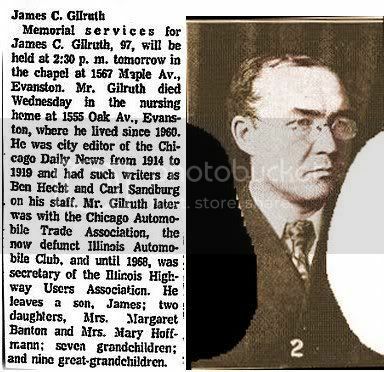 Died: December 5, 1973, Evanston, IL, age 97---d. Wednesdy in nursing home at 1555 Oak Ave.
James C. Gilruth, age 97, of the James C. King Home, Dec. 5, 1973, husband of the late Elsie K. Gilruth; father of James A. Gilruth of Wilmington, Del., Mrs. Fowler Banton of Fayetteville, Ark., and Mrs. August Hoffmann of Fish Creek, Wis., and the late Robert A. Gilruth; seven grandchildren and nine great-grandchildren. Memorial service 2:30 p.m. Saturday at Hebblethwaite Chapel, 1567 Maple Av. Evanston. Burial private. In lieu of flowers, memorials may be made to your favorite charity. 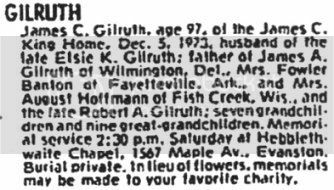 Chicago Tribune death notice, December 7, 1973, pp. B10. Last edited by Bill Burgess; 03-26-2014, 02:59 PM. Died: June 20, 1943, New York City, age 71,---d. heart attack at his hotel. New York Times' obituary, June 22, 1943, pp. 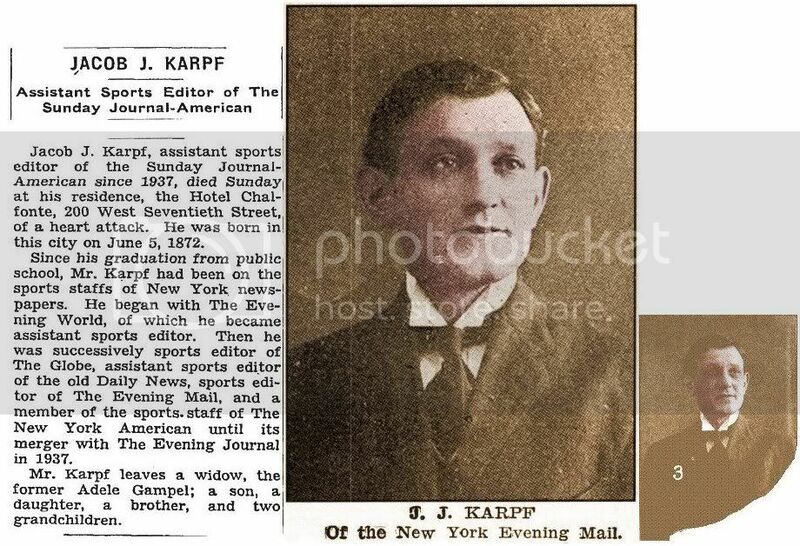 20.-----------New York Sunday Journal-American, assistant sports editor, 1937 - 1943. Last edited by Bill Burgess; 03-26-2014, 01:59 PM. Acknowledged as authority on tennis. Father: Wolf, born Russia 1862? ; Mother: Anna Zeve, born Russia 1862? ; Brother Harry Jerome, born Pennsylvania 1898? ; Brother: Louis born Pennsylvania 1904? ; Brother: Irving; Sister: Mrs. Martin Schwartz; Sister: Mrs. David Eilberg; Sister: Esther; Sister: Teresa, born Pennsylvania 1894? ; Sister: Molly, born Pennsylvania 1902? ; Wife: Kate, born Pennsylvania 1900? ; Daughter: Eleanor, born Pennsylvania 1923?, Son: Melvin, born Pennsylvania 1928? ; Herbert married Kate Gershenfeld in 1921 in Philadelphia, PA.
Last edited by Bill Burgess; 03-26-2014, 01:38 PM. 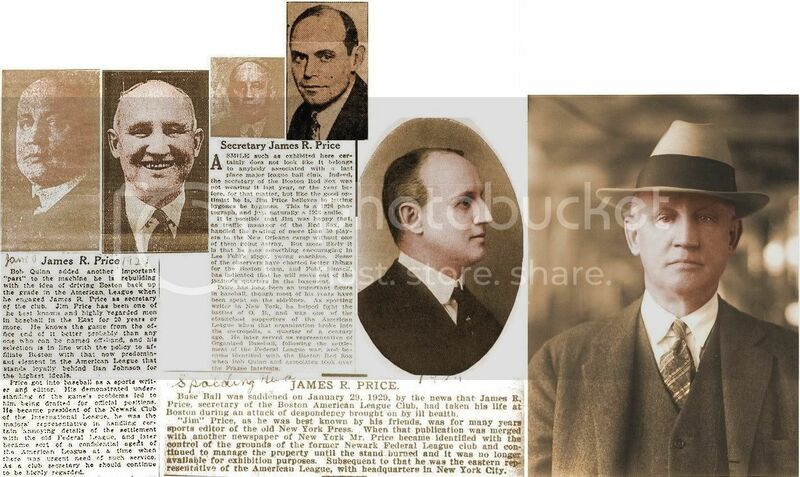 St. Louis Post-Dispatch, sports writer, September, 1894 - 1934; While using the Post-Dispatch as his home base, he left periodically to do outside pursuits. Engaged as personal representative of James K. Hackett, romantic actor. First Missouri Volunteers in the Spanish-American War, 1898. 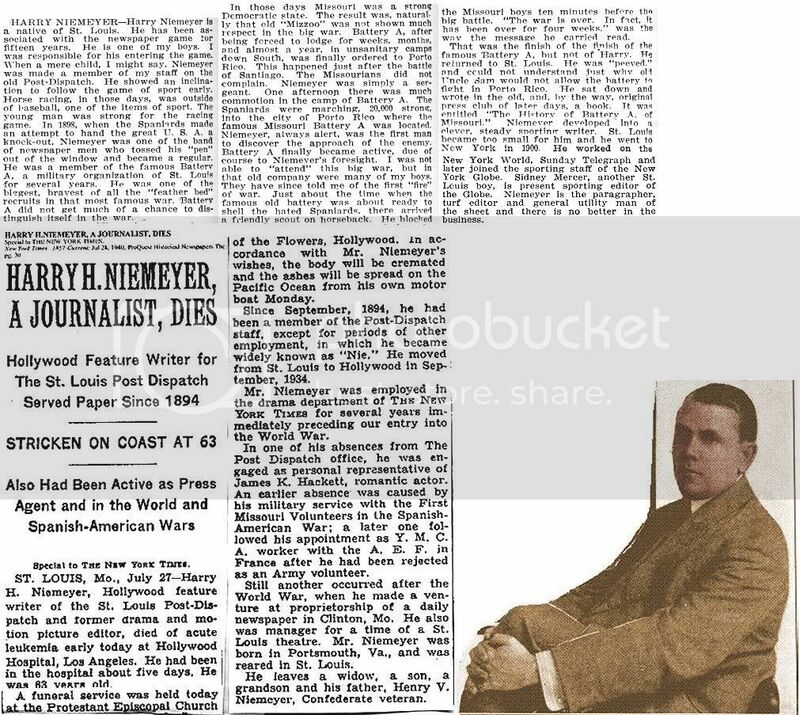 Mr. Niemeyer was born in Portsmouth, VA, but raised in St. Louis, MO. He moved from St. Louis to Hollywood, CA, in September, 1934. Yarns Of Battery A With The Artillerymen At Chickamauga And Porto Rico, 1899? New York Times' obituary, July 28, 1940, pp. 30. Last edited by Bill Burgess; 03-26-2014, 01:13 PM. Sports Announcer, 1929 - ? Philadelphia Inquirer obituary, May 10, 1990, pp. D22. Last edited by Bill Burgess; 03-26-2014, 12:41 PM. Died: October 12, 1951, Cincinnati, OH, age 68,---d. at home after a heart attack. Cincinnati Enquirer, turf editor, 1911 - ?, assistant sports editor, ? - 1930, sports editor, 1930 - 1947. Ohio Sports Enterprises, associate racing steward, 1947 - 1950. Officiated at horse racing events at Beulah Park (Columbus, OH), Ascot Park (Akron, OH), and the Hamilton Fairgrounds. Listed as a 'turf writer' in the 1930 census. 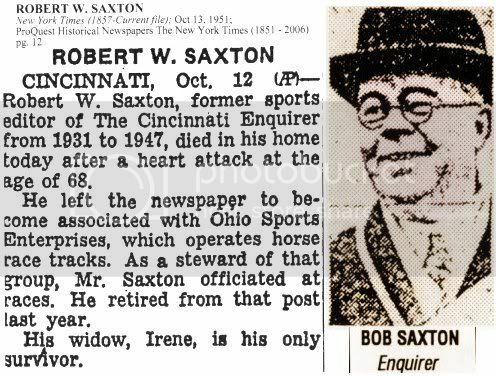 Bob left newspaper work to work for Ohio Sports Enterprises, which managed horse race tracks. As such, he officiated at race tracks. He retired in 1950. 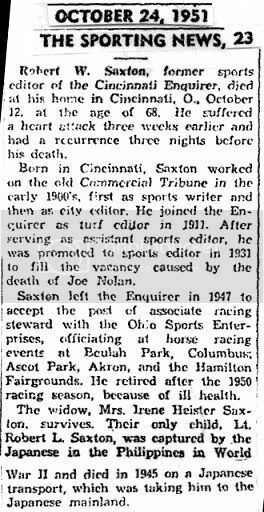 Sporting News' obituary, October 24, 1951, pp. 23.----New York Times' obituary, October 13, 1951, pp. 12. Last edited by Bill Burgess; 03-26-2014, 09:49 AM. Graduated Lake Forest College (Lake Forest, IL). Returned Chicago in 1922 for investment business. New York Times' obituary, October 2, 1938, pp. 49. Last edited by Bill Burgess; 03-26-2014, 09:08 AM. Died: September 19, 1917, Chicago, IL, age 49,---d. sudden attack of kidney trouble at home. Lived in Chicago his whole life. Was a major golfing writer. 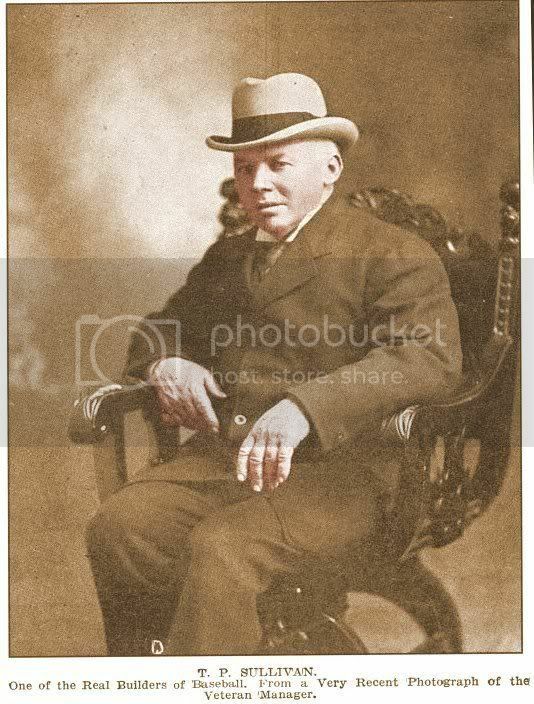 Father: Richard H., born England, January, 1846; Mother: Mary A. Lacey, born New York; Wife: Katherine Stark, born Michigan, March, 1871; Son: Edward George, Jr., born Chicago, IL, February 12, 1895; Son: William, born Chicago, IL, July, 1898. ---------------------------------------------------------------------Chicago Daily Tribune obituary, September 20, 1917, pp. 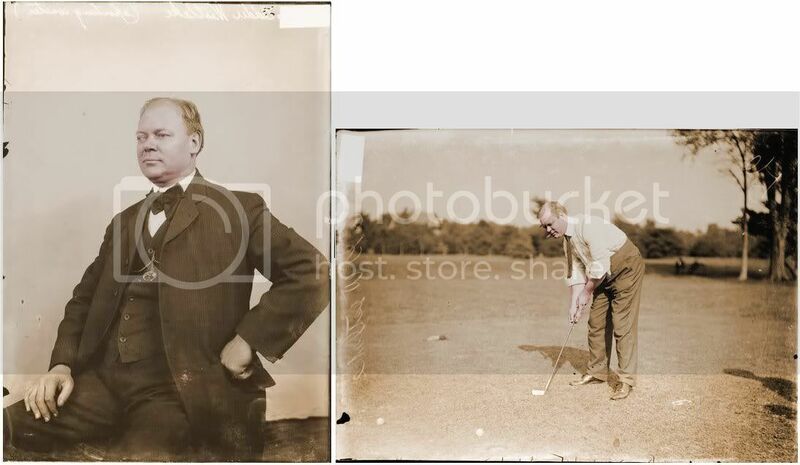 15.----------The American Golfer obituary, October, 1917, pp. 197. Last edited by Bill Burgess; 03-25-2014, 02:08 PM.